It was the summer of 1982. I was 14, living in Eliott, Maine - a small town across the river from Portsmouth, New Hampshire. Our house was empty, as we were moving to Alaska that week, and the movers had already taken our belongings. It was dusk, and I was upstairs in my room, laying in my sleeping bag, listening to the radio, looking out of the window that no longer had curtains. 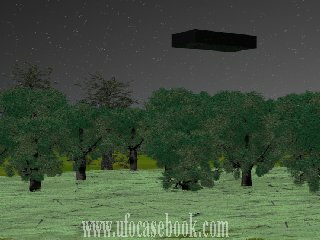 Suddenly I saw a black, geometric object zig-zagging rapidly in the air above the tree line of the woods behind my house. Its distance away from me was about 1.5 football field lengths. Its motion reminded me of an air hockey puck, with seemingly instantaneous changes in direction. It was zig-zagging, but traveling in my general direction. At this distance, the general shape of the object seemed to resemble a coffin - oriented flat with respect to the ground, with the wider end towards the direction of travel, which was towards me. But it was hard to tell because of the distance away and the object's speed. The object kept its height in the air constant, about 5 to 10 feet above the trees. I got up and kneeled at the window to get a better look, but could no longer see it. The way it moved made the sight seem unreal, and I stayed kneeling by the window for a few minutes to try to see the object again, but did not. I could not comprehend what I had seen. As I started to look away from the window to go back to laying down, out of the corner of my eye, I noticed the object hovering above my back yard, about 30 to 40 feet away from my window, at about the same height in the air as my window on the second story of the house. It was perfectly still, and perfectly silent, and it wasn't there a second ago. It looked like it was made of metal, but was a dull gun-metal black, with no windows, lights, doors or seams of any kind, but it did have a few small protrusions which looked like instrumentation - giving me the impression the object was some sort of machinery. It was the approximate size of an automobile. The shape was a trapezoid - a square or rectangle 'front' and a larger square or rectangle in the back, so the craft tapered from the back to the front. It was like a pyramid tipped over on its side with the pointed portion removed. Or maybe a better way to describe it is as a blunted wedge. This shape seemed different from the way it appeared when it was zig-zagging above the trees, but I might have been mistaken of its shape when it was above the trees, since that was at some distance away, and moving rapidly. I had absolutely no fear of the object - only curiosity as to what it was I was looking at. I got to look at it for about 4 seconds, then it left in an instant. It left so fast, that I could just barely tell that it left in a direction, rather than just disappearing. The object left in the opposite direction it came from. And though the craft seemed to have a front and a back, it did not turn around before reversing its direction. When the song on the radio ended, the DJ came on saying that he was getting inundated with calls about some object seen in the air. I called the radio station as well, and told the DJ that I too had seen the object, but that was as much as I told him. I still, to this day, have never heard any other UFO report describing a craft shaped like this. My whole life, I rarely thought about this experience. Not until recently, when I saw a show on UFOs describing the same flight characteristic, did I really start to think about my experience, and realize that what I saw was a UFO. I am an engineer now, and so understand that this craft displayed flight characteristics which defy our understanding of physics. It had no wings or control surfaces of any sort, and was entirely silent. It didn't need to move to stay aloft. It seemed unaffected by gravity or inertia. It had the ability to change speed and direction instantaneously - including the ability to hover perfectly still. Supposedly, there were a lot of people who saw this craft that night. So, maybe there are records of it somewhere. It was a mainstream, pop radio station that I was listening to. No, I did not hear or see any planes or helicopters. weather was a perfect summer evening in New England. Good weather. Clear skies. Dusk. Light level still decent. no smells. no electromagnetic effects noticed - radio was playing consistently. no pictures or video taken that I know of. the craft was hovering perfectly still above my backyard for about 4 seconds. military bases are nearby - my dad was a career Naval Officer.